Learn how grief over the death of loved one is compounded by other losses that occur simultaneously. In this episode I share a conversation with Rev. Terri Daniel about the “other grief” that occurs throughout life with or without the death of a loved one. We’ll talk about this hidden grief and why it is important to acknowledge it as an important part of life. It’s not too late to sign up for A Year of Reading Dangerously and join us in reading books about death, dying and the afterlife throughout 2018! Learn more and sign up here. Thank you to all of the donors who are contributing to my page at Patreon.com/eolu each month! It makes a huge difference and I’m very grateful! Thank you to Suzanne O’Brien RN and Doulagivers.com for being a “legacy supporter” for the past 18 months! Are there avoidable vs. unavoidable losses? Rev. Terri Daniel is a clinical chaplain and end-of-life educator certified in death, dying and bereavement by the Association of Death Education and Counseling. Her work focuses on assisting dying and grieving individuals to discover a more spiritually-spacious understanding of loss and trauma. Remember to tune in every Monday for a new episode and please leave a review on iTunes if you enjoy this content! Learn how travel can provide a “safe container” for healing grief and loss. In this episode I’ll share my own insights into how the experience of travel can help with the process of grief. This is also the subject of the new book I’m writing (I did research for it on my recent trip to Italy) … I’ll share a brief overview here! You can check out all of my Italy photos on Instagram! Each month I host a “Virtual Death Cafe” with fascinating conversations about death, grief and the end of life. Anyone can join by telephone or online. You can learn more about it at www.eoluniversity.com/death-cafe. Also, if you missed Death Expo earlier this month you can still access the replays at this link: www.eoluniversity.com/de17speakers. This podcast is supported through the generous donations of my patrons on Patreon.com/eolu. I’m sending a HUGE THANK YOU to all of my current supporters – your support makes a big difference! Join the fun for just $1 or $2 per month and you’ll receive the “Patrons Only” Q&A recording each month (Hospice Happy Hour!) Go to Patreon.com/eolu to learn more and sign up! During several of my travel experiences in the past I have been dealing with grief and have found the process of travel to be helpful. On one trip to Italy, my husband and I learned of the death of our brother-in-law on the day we arrived in Venice. Unable to cancel the rest of our trip and return home immediately, which we wanted to do, we stumbled through the remainder of the vacation and managed to make peace with our pain. Permission to wander aimlessly. On our Venice trip we canceled all of our sightseeing plans and activities. We started each day with a totally clean slate and just wandered the streets and canals of the city all day long. By following our intuition and our broken hearts we were able to enter into our grief without distraction or attachment. Had we been at home with family we would have felt obligated to “do something” and “be somewhere” but because we were traveling we were free of all expectations. Recognize that all people, everywhere, experience the death of loved ones. Our mortality and the grief it causes us is the interconnecting thread that binds us to all of humanity. Go deep into history. By visiting ancient ruins we can see that all of humankind, throughout history has dealt with the pain of loss and struggled to make peace with death. Our experience of grief is just one part of a vast “whole” picture of human loss. Surrendering to grief to find joy within. As travelers “stuck” in another country even though we wanted to be home, we had no choice but to surrender to the pain that engulfed us. When we allowed grief to find a home within (and even “became” a living embodiment of grief) we also discovered a startling capacity for simple joy over the beauty of being alive. I’ve written this before: suffering hollows us out so that we can contain an even greater measure of joy … and also love. Understanding impermanence. Strolling through cemeteries, relics and ruined structures of the past illustrated to me perfectly that everything that exists in the physical realm is impermanent and will one day dissolve away. Only love and the energy of life persist eternally. And it is the depth of the love we experience for others that causes the magnitude of pain we feel upon their deaths. Grief is one of the visible manifestations of love in the physical realm. Learning how to navigate in unfamiliar territory. On our “grief trip” in Venice we simply wandered every day until we were hopelessly lost. We took in everything around us along the way–noticing all the colors and sounds and fragrances of life. And when we felt ready to return “home” we studied our maps to figure out where we were and to slowly find our way back to more familiar territory. This skill of navigating in the unknown will prove to be very helpful to us throughout life and especially during our own dying process as we struggle to get back to a home we can’t remember. I hope you will take the opportunity to travel some day, even when you are experiencing grief, to experience the profound benefits it can offer! The story of my long journey of healing after my father’s suicide death – told in a series of 8 episodes. or Text HELLO to 741-741. Please don’t give up. There is light in the darkness, there is love for you, there is grace. I have survived and I am here to spread hope. Highest blessings and deepest love to you! Please call 1-800-273-8255 for help if you are thinking about suicide. Click here to talk with someone now. 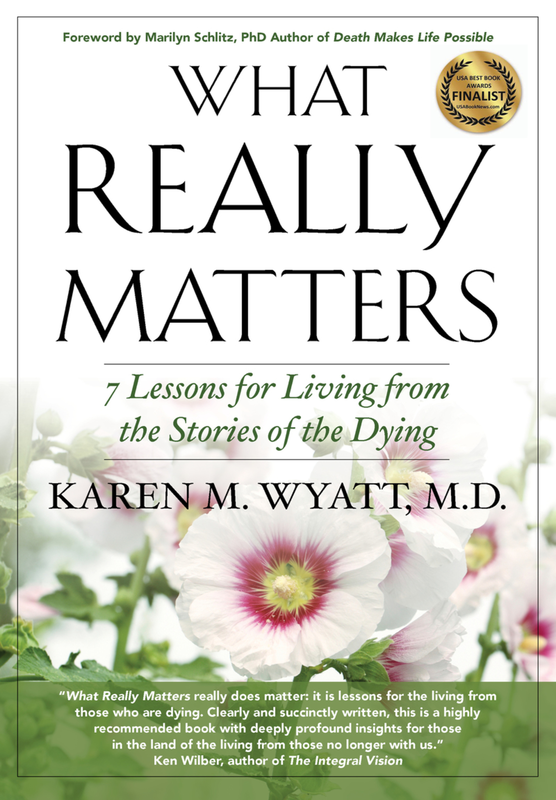 Sign up here for the End-of-Life University mailing list. Visit the EOLU website.